Can text messaging improve the health of Ugandan village residents? An $85,000 grant from the Verizon Foundation promises to help the University of Notre Dame’s Ford Family Program in Human Development Studies and Solidarity find out. The grant will provide improved information and communication technology to the village health team in Uganda’s Nnindye Parish, where the Ford Program has been engaged in community-led development work since 2008. In addition, a Notre Dame research team will study the impact of the updated technology on health outcomes. The Ford mobile health project — “m-Health” for short — will equip the local health center with cell phone-messaging software and low-power computers, making it an effective hub for monitoring community health. Health team members will receive training in mobile literacy — including texting — and then pass on their new skills to hundreds of other Nnindye residents. If all goes as planned, health center workers will be able to start sending messages, to remind women of prenatal or well-baby appointments or to spread the word when supplies such as anti-malarial bed nets or vaccines become available. The Ford researchers and their local partners at Uganda Martyrs University hope better information access will increase rates of prenatal care for pregnant women and lower malnutrition among children. Currently, only half of expectant mothers receive the recommended prenatal consultations, and 15 percent of children are so chronically malnourished that their growth is stunted. The new technology will also allow Nnindye health care workers to keep more consistent, detailed records of care and put in place a referral system for emergency care. The m-Health project was the brainchild of Ford Program staff member Lacey Haussamen, now with the Eck Institute for Global Health, and Tom Marentette of the Office of Information Technologies. Marentette will travel to Uganda to set up the new communications system in January. Recent Notre Dame Ph.D. graduate Luke Chicoine will support the project’s implementation in its first year. Now assistant professor of economics at DePaul University, he focused his dissertation research on sub-Saharan Africa. 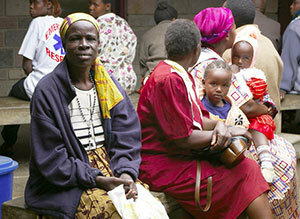 The research team, which includes Ford Program Research Director William N. Evans and Juan Carlos Guzman of the Initiative for Global Development, will study whether using text messages to spread health information successfully encourages more people to take advantage of the available medical resources. Part of the Kellogg Institute for International Studies, the Ford Program promotes the interdisciplinary study of international human development by partnering with local institutions and communities to better understand the complexities of the development process. The Verizon Foundation uses technology to solve critical social issues in the areas of sustainability, education and health care. Originally published by Elizabeth Lawton at kellogg.nd.edu on Dec. 3, 2012. Originally published by Elizabeth Lawton at newsinfo.nd.edu on December 13, 2012.